Disclaimer:These toothbrush heads are manufactured independently by Sonifresh.Our blue reminder bristles fade to white and help you recognize when it’s time for a replacement. (Dentists recommend replace the brush head at least once every 3 months). High quality Generic DiamondClean Replacement Brush Heads made with end-rounded US Dupont Tynex Nylon Bristles for offer exceptional cleaning of tooth surface and deep between the teeth. The Sonifresh DiamondClean toothbrush head features a central stain-removal pad, from densely-packed diamond-shaped bristles to remove surface stains caused by food and drinks. The 4 Replacement brush heads come with caps for hygienic storage and travel,100% Satisfaction Guaranteed or Your Money Back. Give you healthy teeth and a white smile! The toothbrush head features a central stain-removal pad, from densely-packed diamond-shaped bristles to remove surface stains caused by food and drinks. The brush head includes reminder bristles to ensure brush head replacement every 3 months as recommended by the American Dental Association. The 4 Replacement brush heads come with caps for hygienic storage and travel. These toothbrush heads are manufactured independently by Sonifresh. What are you waiting for? Get yours today and to protect your family’s smile! 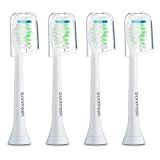 This entry was posted in Dental Shop and tagged DiamondClean, Electric, Heads, pack, Philips, Replacement, Sonic, Sonicare, Sonifresh, Toothbrush by Oral Health Care. Bookmark the permalink.